"As quaint as it sounds, someone has to advocate a return to first principles." Back in the bad old Cold War days Nikita Kruschev told us that we Capitalists were so greedy we would sell the rope our enemies would use to hang us. We've come full circle. Addicts to Liberalism have given Barack Obama socialized medicine. It's the needle that will be used to euthanize them as soon as the death panels decide they have outlived their usefulness. Each time I hear those Sarah Palin ads for John McCain, my understanding of the tough sacrifices required by the game of politics gets a little deeper. On the other hand my imagination amuses me by showing me little videos of her making gagging noises and frantically reaching for the mouthwash as soon as the microphone clicks off. Michelle Malkin fills in the puzzle in a January 22, 2010 article warning us not to succumb to McCain Regression Syndrome: "While he runs to the right to protect his seat, McCain's political machine is working across the country to install liberal and establishment Republicans to secure his legacy." A Choice at Last:: Why JD Hayworth must replace John McCain as Arizona's Senator. Once every six years, when it's reelection time, John McCain comes home to Arizona to try to forge a believable set of conservative credentials... Here's something to keep in mind while he carpet-bombs Arizona with cynical leftist-style commercials. Hearing Ronald Reagan's speeches again it's hard to believe what is now facing us from Washington. Are Americans really where the mainstream media hopes we are? Gold is at an all time high and going higher but Obama is urging us to sell something far more precious at a rock bottom price. Should I stay or should I go? Race, religion or national origin don't matter, it's what you believe. Statist solutions to healthcare abound on both sides of the aisle these days. We all know about ObamaCare so the Republican Leadership Council, formerly known as It's My Party Too has an ObamaLite plan on the table. As usual the moderate Republican group sails in the same direction, just at fewer knots. How about a few ideas that don't deliver your doctor's proctoscope into government hands. The last thing you want to hear from Nancy Pelosi should be "Bottoms Up"! Foolish trades. The Cyclops, a giant with a single eye in the center of his forehead, is one of the fascinating characters in Greek mythology. One story has it that when he originally had two eyes he met a blind witch who could see the future. The witch talked him into a trade in which he would give her one of his eyes so that she would no longer be blind and in exchange she would share her ability to see the future with the Cyclops. But the witch cheated the Cyclops, giving him only the ability to see the time and place of his own death. Stories with a lesson about foolish trades have been around for thousands of years. Judging by the trade Obama is offering us today, cheap affordable healthcare in exchange for our freedoms, as a species we haven't learned much in those thousands of years. Here is hoping all our Republican representatives stand firm against his government takeover of healthcare. National Review Online provides a 5-part video series on the recession, who caused it, what's being done about it and how that compares with what happened in the 1930's. Spend half an hour getting a real education from Dr. Thomas Sowell, you'll be glad you did. Then write your congressman and your senator. 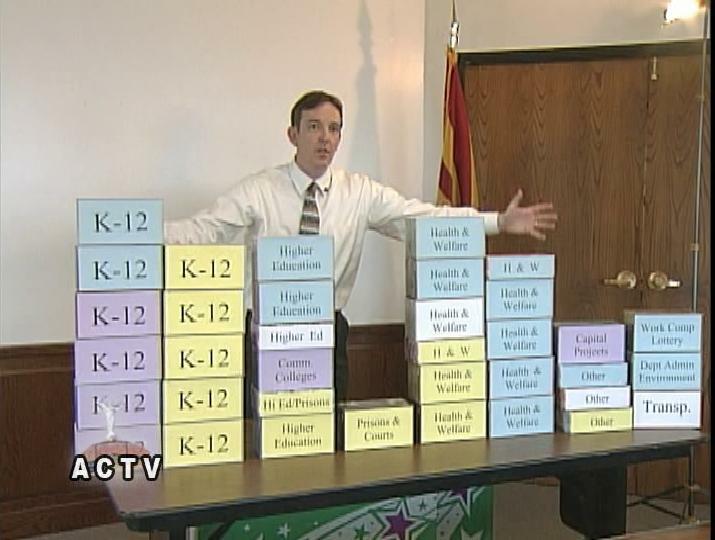 The three stacks on the left account for tax dollars from all sources that go to education. They add up to 16 billion dollars. All the rest add up to 16.5 billion dollars. You can click the picture to get a larger image if you want to see the categories. The point is, nearly half of all your state tax dollars get spent on education. The total State budget is roughly 32.5 billion dollars. That's how much they would spend if they had it. The recession has caused collections to fall about 4 billion short. That's about 12.3 percent if they could cut everything equally across the board. The current recession has provided many of us with a significant decline in our net worth. Your house is probably down between 20 to 50 percent. Your 401-K is probably down 20 to 40 percent even after the recent March run up in the stock market. You may be one of those lucky ones who are still working but maybe you just took a 10 percent cut in pay, that is if you were lucky. Or maybe you're out of a job entirely. The point is, the education folks don't want to feel your pain. They don't want to feel any pain at all. In fact, they want you to feel their pain along with your own. "There'll be Hell to pay if you cut a penny from education." So that means cut the other half of government 25 percent or raise taxes on the rest of us. You'll be hearing a lot from the Education lobby in the coming months about why you should vote to make yourself pay more taxes "for the children". Just ask them to answer you this: "If you can always find ways to spend more money, why can't you step back and see if you can't find a few ways, to spend less money, and do it responsibly, for a little while. Yes, we know it's not really that simple. 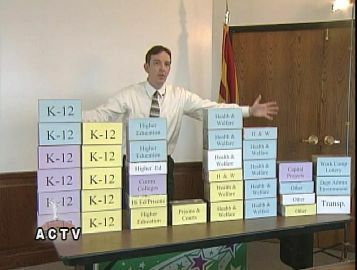 But it could be a lot simpler than it is if your Arizona educators would get in the boat and pull with the rest of us. Meanwhile, click here and see what New York City is getting for all the billions they spend on education. Will the last Republican "gentleman" to take off the white gloves just shut up and lie down. It's too late, you're already dead. ...stop thinking of the Democratic Party as merely a political party... David Kahane of National Review Online tells it like it is in I Still Hate You, Sarah Palin. Had it up to here with those Eastern Intellectual Elites? They should have a degree for what they do, like PHD only maybe it should be EBACS (Educated Beyond All Common Sense). It's time we got back to work here, annoying those so-called Liberals who seem to be doing their best to undermine the principles and the freedoms restored to the human race by those giants who founded our great country. So, this site is back. Its continuing mission; to disseminate information useful to Conservatives interested and active in taking back their country. Some of the information pertinent to the ongoing functions of District 11 formerly kept on this site will be removed, some of it to be taken up by the new official LD-11 site when it comes on line. Other features will be maintained and some will be added as time and imagination permit. You know that what's happening in DC at a frenetic pace will destroy your wealth, deny your freedom, kill your spirit and limit the aspirations of your future generations, yet you can't believe it's really happening. That's what they're counting on. They want to get it done before you wake up. They want to do things that will be difficult or impossible to undo when you do wake up as they know you will, eventually. The last time we went this crazy we got the Great Society. It will take generations to undo the damage perpetrated by Lyndon Johnson but at least the work was begun by Ronald Reagan. Now he's gone and they're at it again, "progressing" toward the socialist utopia that the Russians suffered under 75 years of totalitarian government. You want to speak up but what they're doing is so far off the map you can't think of the words. Fortunately there are some who see what's happening and can write about it from a perspective of history and experience. There is a lot of good writing out there and we'll be linking to it. Right now, you could do a lot worse than peruse the writings of Thomas Sowell. You won't find anyone more grounded in common sense, more literate or erudite in economics and history. The truly marvelous thing about him is that he explains this stuff so anyone can understand it. So start here with his June 23 essay; Republicans in the Wilderness and then go back to his page on TownHall.com and enjoy at least one essay a day until you've covered them all. Do that and before long you'll know more truth about history, economics, politics and common sense than 99 percent of the "intelligentsia" that populate the two ends of Pennsylvania Avenue. …expressing the paradox that democratic societies are difficult to sustain in the spirit of the oft-stated axiom -- attributed to a half-dozen people -- that a "democracy" would last until people figured out they could vote themselves money from the public treasury. Benjamin Franklin offered a similar admonition when a woman asked him to describe the form of government the Framers had just crafted: "A republic, madam, if you can keep it." … unless we rededicate ourselves, intellectually and emotionally, to our founding ideal of individual liberty -- as opposed to succumbing to the insidious, intoxicating, cowardly promise of government-provided security at all levels of our existence -- we can kiss liberty -- and the United States of America as we have known it -- goodbye. … Part of the problem is that we have enjoyed such unparalleled freedoms and prosperity that we have been lulled into the false notion that they will continue in perpetuity, even as we betray, to ever-greater extremes, our founding principles. But traditionalists understand that there is a tipping point beyond which this incessant socialist piggybacking on our capitalistic economic system and these ever-deepening encroachments on our scheme of government (for example, through judicial activism) will finally bring us to our knees. … We know that socialism never works and always results in less prosperity, on top of its obvious freedom-stripping inevitabilities. … As quaint as it sounds, someone has to advocate a return to first principles. We don't have to concede that America cannot reverse its path toward European socialism. But we will have conceded if we merely try to outdo liberals on their terrain by being "compassionate conservatives." Our charge is to make the case for liberty and that traditionalism is inherently compassionate. If we don't have the courage to confront the seductive promises of socialism and demonization by the politically correct and pseudo-compassionate, we will surely fail in our duty to bequeath the blessings of liberty to our posterity. A quarter century ago Ronald Reagan said "Government is not the solution to our problem, government is the problem." Ronald Reagan, by the force of his clear, conservative principles, his personality, and his eloquence dragged the Republican Party, kicking and squealing, out of its "comfortable, complacent minority" status and into the winner's circle. America responded to Reagan's principles, electing him twice by landslides. Republicans lost control of Congress in 2006 because voters no longer saw Republicans as the party of limited government. They have since rejected virtually every opportunity to recapture this identity. But their failure to do so must not be misconstrued as a rejection of principles of individual liberty by the American people. The evidence suggests we are still a nation of pocketbook conservatives most happy when government has enough respect to leave us alone and to mind its own business. The worrisome question is whether either political party understands this. That's been our message in District 11 for four years now. Our State Party carries the same message and despite being outspent by Democrats anywhere from five-to-one up to twenty-to-one Republicans gained in both the House and the Senate in Arizona. The as yet unanswered question is: Is the RNC listening? f you listen to talk radio or Fox cable news, you've heard the name Saul Alinsky mentioned recently in connection with B.O. No, I'm not talking about European concepts of personal hygiene, I talking about another of Barack Obama's personal heroes. Unfortunately the smell is just as bad. Melanie Phillips, a writer in the UK explains just what "community organizer" really means from her vantage point in a society that has been preceding ours down the road to socialism for decades. To read the whole story at your leisure, click here. We are fiscal, social, cultural and constitutional conservatives. We have been called divisive and been accused of destroying the Republican Party in Arizona for stubbornly standing by our principles. Our accusers, many of them former leading figures in the Republican Party here in Arizona and like-minded business leaders seem to think that a successful Republican Party would look and act a lot more like the Democrat Party. It is by virtue of Conservatives here in Arizona and across the country who cling stubbornly to their principles (along with their guns and bibles), that the McCain campaign saw the wisdom of choosing Sarah Palin as running mate. From what we know about Team McCain, had Conservatives chosen to "go along to get along" as has been strongly recommended by our local and national opposition in our own party, Team McCain would have made a far less propitious choice. John McCain is proud of his reputation as a "maverick" and his independence from "establishment" and party. But, with his choice of Sarah Palin, he has acknowledged that conservative principles are important and that party is indeed intrinsic to his success. As President he will no doubt disappoint conservatives from time to time, as has every other Republican President, but we look forward to working to put the McCain / Palin team in the White House and conservative Republicans into office everywhere in Arizona. what Elian was sent back to. Don’t Let This Movie Get Lost by Kathryn Jean Lopez,National Review Online Andy Garcia’s most recent movie is oceans apart from what you might have seen him in lately—say, the big-budget box-office success Ocean’s Eleven (or Twelve)—but it’s a movie that should not get lost. Movie reviewers—a club of which I most definitely am not a member—have taken issue with The Lost City: It is, they point out, too long. But viva The Lost City anyway—it more than makes up for its flaws in its myth-busting cultural contributions. Here in the U.S., where Che Guevara T-shirts are a staple at most soccer-mom shopping malls and on college campuses, it´s a countercultural revolution of a movie. 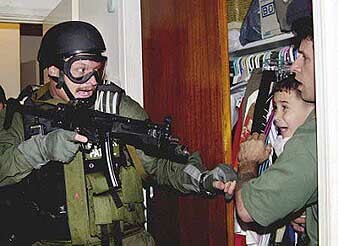 If Bill Clinton and Janet Reno were still in charge—thugs at the ready to send a boy back down to be Fidel´s poster boy after his mother died getting him here, to freedom—I´d be advocating showing the movie on the Ellipse, marathon-style. The Library of Congress Congressional Research Service CRS Report for Congress on the Major Policy Issues and Status of Negotiations of the FTAA is available here in Adobe PDF format. It is current as of Feb 16, 2005, is six pages long and provides a lot of information on the subject.